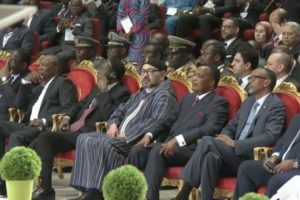 King Mohammed VI of Morocco underlined that the Blue Fund for the Congo Basin is a rallying project which offers promising prospects for the Congo Basin, for the region and for the African Continent, as a whole. King Mohammed VI who was delivering a speech Sunday before the first Summit of Heads of State and Government of the Climate Commission and the Blue Fund for the Congo Basin, held Sunday in Brazzaville, said the Congo Basin is the world’s second most important region for global carbon storage and the second largest river basin. “It is also one of the largest forest areas on the planet – a region which is home to more than half of the Continent’s animal species. This regulator of the planet’s climate makes Africa the world’s ‘second lung’. It is here, and now, that the future of this vital asset is being shaped, he said. Africa has irreversibly embarked on a path towards profound change. With each passing day, our Continent is asserting itself more and more, looking to the future with confidence and serenity. And yes, we do realize there are plenty of challenges. To be sure, the most significant of these, today, is how to reconcile the need to achieve development in our Continent with the awakening of ecological consciousness, he said, calling for a collective awareness of the devastating effects of global warming on the planet. “Our meeting today sounds like an urgent wake-up call for us all. It is vitally important for our Continent – indeed for humankind – because it implies a collective awareness of the devastating effects of global warming on the planet. Ours is a collective responsibility: to safeguard African biodiversity,” he said, insisting that “the depletion of that common heritage has a far-reaching impact on people’s daily lives and is detrimental to the socio-economic development of the communities which depend on it”. The Monarch recalled that the Congo Basin Commission, chaired by the Republic of the Congo, was set up, along the Sahel Commission, chaired by Niger; and the Island States Commission, chaired by Seychelles; at the first Africa Action Summit held in Marrakesh on the sidelines of COP22 in November 2016. Thanks to the leadership of President Denis Sassou-Nguesso, the Congo Basin Commission has achieved tangible progress in terms of turning the climate challenges facing the region into opportunities, he said recalling the steps covered since the Blue Fund was created in Oyo in March 2017. Its operational measures were agreed in Brazzaville in November 2017, and the implementation of the project was fast-tracked in Rabat in March 2018, during a meeting on the terms of reference of the Blue Fund’s preparatory study. Throughout the process, Morocco has rallied behind this ambitious project to ensure its success, building on the expertise it has gained in tackling climate change. “I decided to support this program because it is based on a new paradigm that fulfils current and future needs. It is centered on integrated, inclusive, solidarity-based programs offered by the new blue and green economies. This decision is also justified by the human dimension, which is a pivotal component of the project. Indeed, an inclusive, participatory approach that involves the region’s inhabitants is essential”. The Monarch, asserting that collective mobilization is crucial, insisted that the establishment of the Blue Fund must go hand in hand with the mobilization of economic stakeholders and civil society organizations so that tangible mitigation and adaptation measures may be taken, and climate-resilient development guaranteed. Acknowledging that financing is the main challenge facing the implementation of the project, the King stressed the need to innovate and come up with mechanisms that will help identify and raise financial resources. “We need to convince bilateral and multilateral donors – public as well as private – of the pertinence of the project”. The Monarch who underlined the positive fallouts of the project said the Blue Fund will inevitably trigger a positive dynamic which will involve projects that will boost and benefit Member States’ economies. “I am thinking, in particular, of measures to improve inland waterways, develop secondary ports, promote sustainable fishing practices, fight river water pollution and upgrade irrigation systems with a view to increasing agricultural productivity”. This new water-centered economy will be the main driver of development, he insisted, warning that aside from the consequences of climate change, food shortages and dwindling water reserves can lead to significant population migration flows, weaken states and create precariousness. After he underscored that these issues are at the center of his concerns and action, King Mohammed VI renewed Morocco’s determination to work resolutely and unremittingly for the implementation of the Continent’s large-scale development projects. 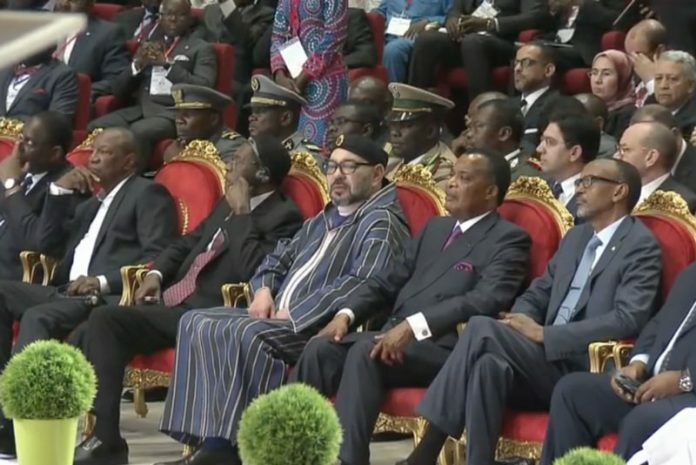 At the end of the summit, King Mohammed VI and other participating heads of state signed the protocol setting up the Climate Commission of the Congo Basin. Posted by Hafid El Fassy on April 29, 2018. Filed under News, Zoom. You can follow any responses to this entry through the RSS 2.0. Both comments and pings are currently closed.